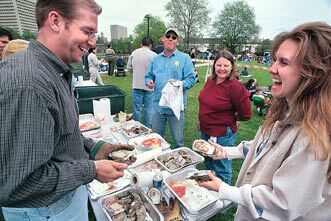 From the banks of the May River down in Beaufort County, to game day get-togethers outside Clemson's Frank Howard Field in the Upstate, South Carolinians unite in their devotion to the ancient ritual of the oyster roast. It's a scene repeated thousands of times every year throughout South Carolina. People of all ages stand shoulder-to-shoulder around tables, oyster knives and damp towels at the ready. Steaming oysters fresh from the fire or steam pot are dumped into the middle of the table. Grabbing the still-hot oysters, hands wet and gritty with crumbled shell fragments, they lever open the shells to get at the juicy morsels inside. Some dress the warm, salty meat with Tabasco sauce or pepper vinegar. Some place each oyster on a saltine cracker. Some dip them in melted butter. "I like either a horseradishy cocktail sauce, or just a plain oyster," says Marty Cousins, whose family for many years held a roast each autumn on their property near Prosperity. Cousins says the oyster roast grew bigger every year. "More and more people started coming," he says. What started as a small family event became a major undertaking. "At times we'd plan for two hundred people," Cousins says. "A roast is a huge deal, especially in this state." Residents of what is now South Carolina have been cooking and eating oysters for thousands of years - since long before European settlers arrived. Shell mounds and rings dot the coast. These piles of discarded oyster shells and other refuse, called middens, were left by early Native Americans who lived in the area. The earliest shell mounds date to 2000 B.C., according to Dr. Victor G. Burrell Jr.'s South Carolina Oyster Industry: A History. That's 3,500 years before European contact. Some of the mounds contain pot shards and other waste that has helped archaeologists learn about these early inhabitants. And these discarded oyster shells aren't just from raw oysters. Many of them are "fire blackened," says Burrell - evidence of early roasts. Oyster roasts continued through the centuries. 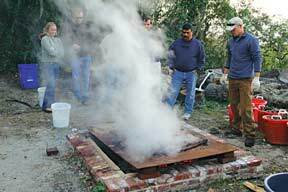 Burrell describes an antebellum oyster roast at an Edisto Island plantation: slaves gathered oysters, poured them on hot coals to roast, and served them to the assembled group on wooden platters. The plantation owners and their guests washed the oysters down with a punch made from lemons, hot water, sugar and Irish whiskey. By this time everyone was hungry and the steaming hot oysters were taken up in shovels and poured on the tables ready to be eaten... The visitor soon found himself lifting the piping hot oysters out of their shells with as much ease as if he had had a lifetime of practice. The plump morsel, dipped in the spicy sauce and swallowed in one juicy mouthful, was a treat, he agreed, for the most jaded appetite. To his astonishment he put away several dozen oysters without even realizing it. The oysters at the heart of South Carolina's roasting tradition are nothing out of the ordinary. 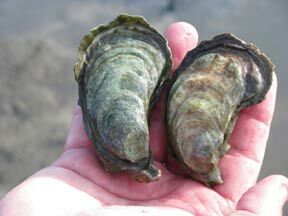 Oysters on the East Coast, whether in Wellfleet, the Chesapeake, or small tidal creeks in South Carolina, are all of the same species: Crassostrea virginica, also called the Eastern oyster. Oyster gourmets consider it a workmanlike oyster, mild and delicious. Oysters live in intertidal zones - areas that are underwater at high tide and exposed at low tide. In South Carolina, that means primarily tidal creeks, rivers and sounds. Arguably the most famous South Carolina oysters are found in the May River, a tidal river near Hilton Head Island. "They just have a reputation of being the sweetest, saltiest, tastiest oysters in the world," says Larry Toomer, who runs the Bluffton Oyster Company, the only active oyster-shucking facility in South Carolina. Toomer holds the culture permit for the May River, which means he grants permission to licensed independent harvesters to gather oysters from the river and sell them to his company. Toomer's grandfather moved to the Hilton Head area in 1913 and opened an oyster facility on Jarvis Creek. His sons went into the oyster business, too, operating shucking facilities throughout the southern Lowcountry. 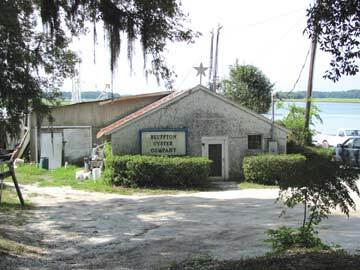 The Bluffton Oyster Company, meanwhile, was opened in 1900 and operated under a series of owners until Larry Toomer and his wife, Tina, took it over in the mid-1990s. Today, workers at the Bluffton facility still shuck oysters by hand, much as they did a hundred years ago. But the company has branched out to other offerings: they sell local shrimp and other seafood, and they cater oyster roasts and other events. These days, in fact, catered oyster roasts support Toomer's business nearly as much as the sale of shucked oysters, making up about 40 percent of the company's profits. Toomer began roasting oysters early in life. "I've been cooking oysters for other people since I was probably twelve years old," he says. "I used to go harvest oysters and take them to people's houses." These days, throughout the state, many an oyster is roasted in the name of civic pride or hospitality. Festivals, company picnics and church outings - all are cause for a roast. Says Toomer, "With the influx of people from other places coming here, one of the first things they learn is that they have to have an oyster roast or attend an oyster roast." "We constantly get questions about 'How do you do this, how do you do that, what else do I need,' " he says. Often, there isn't just one answer to those questions. Some people roast and serve their own oysters according to techniques passed down by families over the years. Others hire caterers to take care of the details. Want to hold your own roast? Obtaining oysters is the first step. Most seafood markets and distributors can order local oysters. For do-it-yourself types, South Carolina allows recreational harvesters with saltwater fishing licenses to gather two bushels per person per day from designated oyster grounds. Two bushels is enough to supply a small gathering: you'll be surprised how many oysters a person can put away at a roast. "I like the magic number of seven people per bushel. That works out pretty well," says Larry Toomer. For the tables, you'll need oyster knives, damp towels for cleaning hands, and buckets for discarding shells. Some people like gloves to protect against sharp points on the shells. There are several different schools of roasting technique. Marty Cousins advocates one classic method: build a cinder block fire pit and a big fire, cover the pit with sheet metal, dump the oysters on top, and cover them with moistened burlap sacks. The wet burlap method can also be used on a charcoal or gas grill. The steam pot has become another common way to prepare large quantities of oysters, although the oysters aren't technically roasted. "The steam pot is the most popular, simplest, cleanest, easiest to learn," says Larry Toomer. "I love to cook on an open fire, but I hate the smoke in my face. After a while, when you do so many of them..." he trails off. 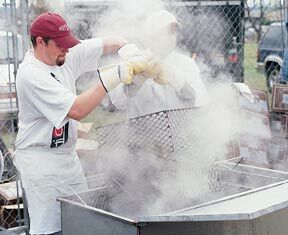 Toomer roasts a lot of oysters. "You know, we do them at home because we love to do them; we do them for other people to make money." No matter the method, it's important not to overcook the oysters. As soon as the shells gape slightly from the heat, the oysters are ready - roast them any longer, and they'll dry out. Opening a roasted oyster is easy. 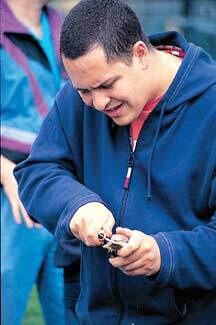 Find a spot near the hinge where the shell gapes enough to slide in the point of an oyster knife, then twist the knife, levering open the shell. After an oyster roast, don't throw away those shells. Donating them to the S.C. Department of Natural Resources' Oyster Shell Recycling program can help improve South Carolina's oyster population. The science is simple: Oyster larvae (called spat) attach themselves to existing shells and other hard masses (known as cultch), building new homes on old foundations. The Oyster Shell Recycling program tries to provide plenty of places for these larvae to land. The program crew collects shells from restaurants, caterers, festivals and backyard oyster roasts. Then, during the critical summer months when oysters spawn, the crew deposits those shells on state and public oyster grounds up and down the coast. During the 2009 spawning season, the program recycled 16,161 bushels of oyster shells and returned 18,762 bushels to South Carolina waters, providing homes for countless new oysters. Many oyster shells are donated to the program by individuals and civic groups that hold oyster roasts, explains program manager Andy Jennings. "They'll call us; we'll pull a trailer over there and maybe pick it up the next day." The program also maintains oyster shell drop-off sites. "We have twenty-two set up in the coastal counties," says Jennings. "We're working on getting some more sites set up this year." Unfortunately, all the drop-off sites are in coastal counties. In the Midlands and Upstate, lots of shells end up paving driveways or, worse, in landfills. "That's a major problem," says Jennings. "I'd love to be able to catch all those shells from up there." The collected shells are hauled to one of four big repositories, where they are quarantined for six to twelve months. Left to dry in the sun, the shells are rid of diseases and hitchhiking species that may be on the oysters imported from other states that could harm South Carolina's oysters. The recycling program staff also clean the shells, carefully picking through them to make sure no trash remains. When the shells are ready to be reintroduced to the water, the crew uses a dump truck and front-end loader to transport the shells to a boat ramp. A small tractor pushes them into a machine called a force feed loader that quickly moves the shells up onto a barge. 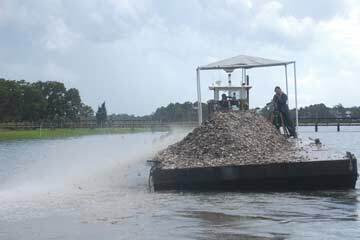 Oyster shells aren't light - each barge load is 1,000 to 1,200 bushels of shells, weighing 60,000 pounds or more. At high tide, the barge makes its way to the oyster grounds, where the crew uses a high pressure water cannon to blast the shells off the barge and into the water at the selected site. Jennings says state biologists' annual surveys of shellfish grounds show the program is working. And though oyster populations have been in decline worldwide for some time, says Jennings, the South Carolina population is less threatened. "We had a record commercial oyster harvest last year," he says. "Best we've had in fourteen years." Visit the DNR's Oyster Recycling and Restoration program for more information about shell recycling drop-off locations and ways for citizen volunteers to get involved with oyster-bed restoration. Eva Moore is a Columbia-based freelance writer and a connoisseur of Southern foodways. She writes the Chew on This column for the Columbia Free Times weekly newspaper.